Save up to 50% off this Black Friday in our fabulous pre Christmas Sale. Head over to our website on Friday 24th November to get your hands on hundreds of our bedroom furnishing items, all with a wonderful 20%-50% off the standard retail price. Perfect for Christmas, we have a huge range of items sure to put a smile on your little ones face. Take a look at our tooth fairy cushions for your little princesses, or for the budding explorers in your family take a look at our cute dinosaur cushions. 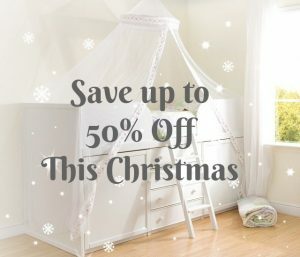 If you’re looking to spruce up your little ones bedroom before Christmas, make sure you check out the discounts on our duvet covers and curtains. Looking for an even bigger bargain? As part of our sale event, each day we will be promoting different spotlight items with a whopping 50% off! Make sure you’re following us on social media to keep an eye out for our fabulous spotlight deals. We have a range of quirky and cute items for you to choose from, whether you’re looking for gift inspiration or to simply have a mini refurb; our furnishings sale is not to be missed! Discount whilst stocks last. 50% Spotlight items will only be on sale at this price for 24 hours. Please order any items you require for Christmas before the last posting date which is Wednesday 20th December.